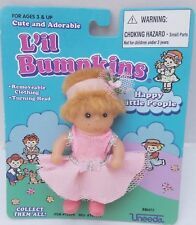 Excellent 2 piece outfit for 19"-20 Fashion dolls-doughnut snap. 19" doll is just modeling. Taffeta/silk type fabric,black and yellow. Please see full item description for more details. Uneeda Suzette or Tinyteen. The doll poses well in all joints; hair is dry and body is discolored. Dress is in very good condition with no stains or tears. This item is in used condition and may have flaws or imperfections. Marked Uneeda 2 S. Pale pink shantung silk outfit (not sure if original). This doll has a vinyl head and hard plastic body with 16 articulated joints. Black widow's peak hair. The doll is in very good condition but does have a few issues. The pieces have been displayed, but never played with.The lot contains a total of 6 pieces. All of the pieces appear to be factory made (see photos). All of the pieces appear to be factory made (see photos). One dress has a pink mark on it (we have not attempted to remove it, center dress in last two photos). All of the pieces appear to be factory made (see photos). It has two signature Uneeda concentric circle buttons for closure. This particular Suzette dress is rare and hard-to-find; it is a beautiful dress. In vivid red (no fading or fade spots). All of the pieces appear to be factory made (see photos). One dress does need a minot seem repair. For Uneeda Suzette Collectors: There are no books devoted strictly to Uneeda fashion dolls and Miss Suzette in particular. The magazine pages are in protective sleeves. It has two signature Uneeda concentric circle pink buttons for closure. This particular Suzette dress is rare and hard-to-find; it is a beautiful dress. In pink dotted Swiss (no fading or fade spots). The lot contains a total of 6 pieces. All of the pieces appear to be factory made (see photos). I would consider the dress in minty condition except it has a couple broken threads where sleeves are attached and back fabric under buttons needs to be folded under and pressed in place. It does not look or feel like it was played with. Slight discoloration on stomach, very faint, scrapes to hair near part. Comes with 4 articles of clothing believed to be original. This particular Suzette ensemble is rare and hard-to-find in this BROWN PRINT color (the orange and blue versions are more common). The jacket is in fine shape, and is lined --but the lining may have faded (changed color) w/ the years (it is not as vivid a color as the grosgrain ribbon on the dress, which it originally matched?). Vintage Uneeda Wendy Barbie Clone60s Jewelry Shoes Mommy Made Dress And Extra Clothing. Early 1960s doll from estate of lifelong collector. Has her original necklace, earrings, and shoes (strap of one is split apart at the top). Marked “U” on back of neck. Gorgeous original hairdo. Pretty face. Features have some paint loss from play. Lower half of legs have faded. Finger and toe nails have been painted. Bottom of shoes and fingertips have some chew marks. In pretty mommy made dress with extra clothing. Please see photos for condition details. Items are sold as is. I’m happy to answer your questions and provide additional photos! Excellent condition. Lots of thick hair and bangs. Pretty painted eyes. Straight pink tone body. Moveable Head and arms. U on back of head. Wearing red and white zebra swimsuit. See photos. There is a dark dot on one lip and as rooted, the hair in back is pretty choppy. Otherwise the dolls appears to be in good condition. Marked Uneeda 2 S back of head. New lace undies Straw bonnet. Black mark on right breast (see pics). She has no ink or bite marks, no seam splits, no missing hair plugs, and she is clean throughout -- including clothing. I want to point out, that these Uneeda fashion girls have manufactured colorless marks across the outside of their fingers that define the finger joints. Condition is Used. As it’s as its. In blue plaid print (no fading or fade spots that I can detect). The top has one button for closure and the pleated skirt has a 1-button closure; grosgrain ribbon bow trim on top is good/intact. Miss Dollikin is in excellent condition with no major condition issues and still poses well (she's been restrung). 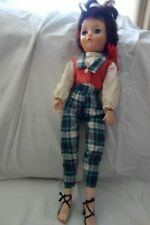 This is a Uneeda Dollikins doll from the early 1960s. A pretty doll and the stand will be included for display. She is in good shape but missing her shoes and has a spot on back of neck. Walking doll. Marked (c) Uneeda Doll Co. He is believed to be Bob, Suzette's (or Tinyteen) boyfriend. He's in very good condition with a fully posable head and no significant condition issues; clothing has been replaced. This little guy is all vinyl with purple and pink flower outfit. He is about 8" tall. He has not been removed from his container and has the cute pixie face famous on Uneeda dolls. PEtal People. The doll is in good condition with little to no wear. This is a pretty Eeegee 60's doll. I tried to find her but only could find a blonde one. She has a light green tint to her hair that is still shiney and clean. She is in really good shape for age with the exception of one small " beauty mark" on her arm. She is wearing a white felt hat with a red bow around the top. She is a reissue of the dolls from the 1960's. 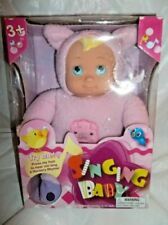 She has bendable arms, movable legs and ball joint neck that enables head to turn in all directions, rooted silky hair, long sweeping eyelashes, and baby blue eyeshadow. Beautiful clean condition as shown. Miss Suzette has a beautiful face with nice face paint and blush. Her original Y body is in good condition as shown. She's marked on her back, "UNEEDA DOLL CO. INC. 1962". The print dress and jacket from her "Evening Ensemble" are in lovely condition. Excellent orihinal box 3 1/2 in. New ListingVINTAGE PRETTY FASHION DOLL 16" INCHES~Red Hair/Blue Eyes~Museum Find! In fair/good condition. Wearing a skirt, blouse and pantys. Dusty and in need of cleaning! Marked with ,museum number and donation date. Vintage 1950-60’s Uneeda 20" Baby Doll in Clothes. Condition is Used. Shipped with USPS . Doll is marked “u” on back of neck. Needs cleaning, has pink mark on forehead.. Ties, and fingers all there. Pink dress and plastic pants. 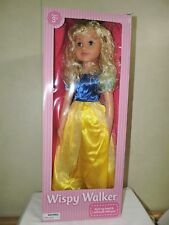 UNEEDA 30" WALKING DOLL Ballerina with 2 OUTFITs - there is writing on the box but it was never used. The hat has a stitch on each side, connecting to the head. Not sure if this is original to doll. Five dolls from the 1960s-70s, in various conditions. Cleaned as well as possible. Little doll is a 1965 Uneeda Pee Wee doll. Use for parts or found art. Barbie Fashion Queen style Clone. I am a Life Long Barbie collector and an avid Fashion Royalty Collector of over 11 years. Brunette Head with 3 wigs. Wigs look good and uncut. Blonde pigtails wig has original ribbons but the rubber-bands have stared to rot and need to be replaced. One Cheek Has More Makeup On Than The Other. Vintage1967 Uneeda Tiny Teens Doll . Condition is Used. Blonde rooted hair, original clothing and boots. 5" high, clean. Super cute. Prom doesn’t have shoes. Blonde has complete outfit and skates (one skate blade is partially missing. Both have long rooted eyelashes. See photos. My first baby doll was almost as big as I was when I got her in the early 1960's. She is wearing her original silky nylon and chiffon dress with bonnet. The ribbons show age. Elastic waistband of original underpants has stretched out. Vintage Uneeda Doll Co. Inc.? 20" Sleepy eyes Cloth Body Baby Doll 1960's ?